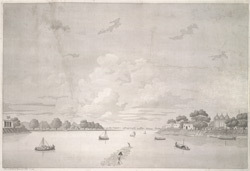 'View of Moorshedabad [Murshidabad] from Moradbaug'. Aquatint, drawn and engraved by James Moffat, published Calcutta 1804.
bl.uk > Online Gallery Home	> Online exhibitions	> Asia, Pacific and Africa Collections	> 'View of Moorshedabad [Murshidabad] from Moradbaug'. Aquatint, drawn and engraved by James Moffat, published Calcutta 1804. Aquatint of the view of Murshidabad drawn and engraved by James Moffat (1775-1815) and published in Calcutta in 1804. James Moffat, a Scotsman, was based in Calcutta from the age of fourteen and is thought to have learnt his trade as an engraver in the city. Murshidabad is situated north of Calcutta in West Bengal. In 1704, the Nawab of Bengal transferred his capital from Dacca to Murshidabad. In 1757, a series of military disputes between the Nawab and the English East india Company resulted in the rise of English supremacy in Bengal. Although the town of Murshidabad continued to house the residence of the Nawab, it was no longer a place of politcal power.